My friend Jean went to a Super Bowl party and we got to make penguins for the event! In this batch we had football players, refs, cheerleaders and spectators. Jean printed out a picture of a football field and we put that on some foam board and wrapped it in green plastic wrap. 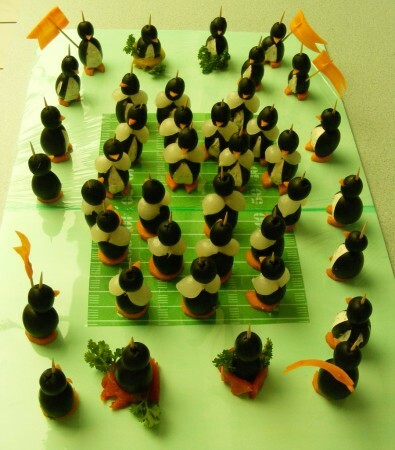 The players have cocktail onion shoulder pads, the cheerleaders have parsley pom-poms and the spectators have carrot flags. Next time one team will wear green olive heads. Or one whole team could be made of green olives! 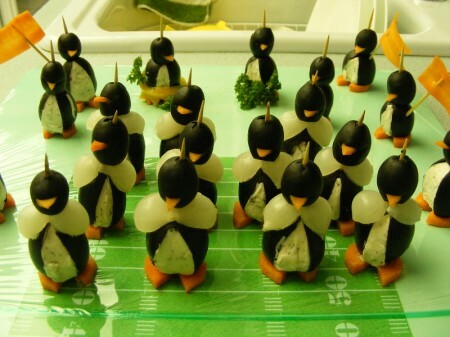 And perhaps a tiny carrot bikini top held on with a dot of cream cheese over the middle of it, for the cheerleaders. Anybody have other ideas on how you can decorate football penguins? Feel free to comment below. If you like these, you can get the recipe and more details here.